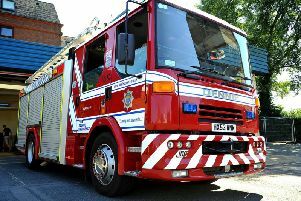 The owner of one of the flats destroyed in a fire who had recently broken his leg has thanked the community for their support. When Bob Bruce-Hay left the Thomas A Becket pub in Rectory Road after drinks with friends on Monday, little did he know that just a few hours later, he would be back there again watching all his possessions being destroyed in a fire that ripped through his apartment and several others. It was his first weekend back at home after two-and-a-half weeks in the Conquest Hospital in Hastings, following a fall at work which shattered his femur. The semi-retired signwriter, known to many as northern soul DJ Robbie May, was staying positive despite the series of unfortunate events. He said: "You have to have a positive outlook on these things. What has happened has happened, and there is no good getting depressed about it. You have to keep a positive attitude and keep smiling." He said the silver lining was that no-one was killed in the fire. He said: "We would have been in bed and it might have been a totally different story. There could have been an awful lot of fatalities. If it had to happen, I'm glad it happened when it did." When Bob, 68, returned home from the Thomas A Becket pub, he had just put on some casual clothes for an evening in front of the television when he heard banging at his door. It was someone from the pub telling him the roof of his flat was on fire. He was about to go back inside to get his wallet and his phone when a fireman appeared and told him to 'get out now', and he was evacuated to the pub along with his neighbours. He watched as firefighters battled the growing blaze until they were ushered inside as the smoke clouds grew. He saw the flat above his collapse into his apartment, destroying all his belongings, and fire crews pumping thousands of gallons of water into the 'gaping hole' where the roof of the building had been. He described the sight as 'traumatic', adding: "I was in complete shock, a disbelieving numbness." Bob's daughter Laurel raced down to the scene after hearing of the fire through a friend, and took him to her one-bedroom flat in Field Row, Worthing, where he has been staying since until he can find temporary accommodation while his flat is being repaired - a process he was told could take a year. The next day, he returned to his flat to speak to the firemen, who he described as doing an 'absolutely superb job', and one of them went back into the building to retrieve his phone and wallet. Sadly, his phone was completely smashed, but he was able to buy new clothes and toiletries. Among the possessions he has lost are antiques from his late mother, all his DJing equipment and a 120-year-old Aspidistra plant he was looking after for his friend Veronica which was named Gertie after her mother. He described the staff at the Thomas A Becket pub as 'absolute stars' for their help, and thanked everyone for their donations and messages on Facebook. He also thanked his daughter for letting him stay in her flat. He said: "I would like to thank everyone for their concern and good wishes. It has been a great help and it has been really uplifting for me. I'm lucky to have a huge circle of friends." Rectory Road has now been reopened, and the investigation is still ongoing into the cause of the fire but is not being treated as suspicious.